Maps are dangerous. They're small and flat and interesting, just perfect for seducing you into long and crazy bike tours. During our little trip to Devon, I was reminded of the reality of travelling such distances, and started to wonder just what the hell I was doing trying to cycle from one end of France to the other. Well, the first day of that trip wasn't exactly easy. The great start continued when it began to rain. Seriously. Climbing the hill out of Cherbourg on the D900, I was suddenly caught up in huge gusts of wind and rain sheeting across the road all around me. I could barely see, and stopped on the grass verge for a while, turning my raincoated back to what felt like buckets of water being hurled at me. I was soaked in a matter of minutes. It eased off a bit after a while, but I was rained on all the way to Bricquebec. At Bricquebec I found an Intermarche where I could replace my confiscated cheese, pick up some dinner and break one of my large notes. The rain had magically stopped by the time I came out again, and bits of blue had started to poke through as I continued down the D127. The roads were quite enjoyable. Unlike in the UK, most minor roads in France have numbers and decent signposting. Hills are pleasant - single arrow hills involve continuous pedalling in low gear for a long time rather than huffing and puffing up a 20% gradient and stopping every couple of metres. There are double and triple arrows on the map, but those are mostly avoidable. I found a nice picnic bench at St. Sauveur de Pierrepont upon which to eat my lunch of bread, butter, tomatoes and Camembert - the cheese was a bit feety but everything else was lovely. The afternoon was quite sunny and I dried off quite quickly. Just before La Haye-du-Puits, I was diverted off the road onto a cycling / walking / horseriding track with a sign pointing Le Mont St Michel, which I was hoping to reach the next day. Marvellous, I thought, and followed the track for the rest of the day, passing Lessay, Periers and St Sauveur-Lendelin. It was nice to be away from the traffic (although with French traffic there is really no need) but the track got a bit boring after a while. There were very few signs and very little indication of where I was. 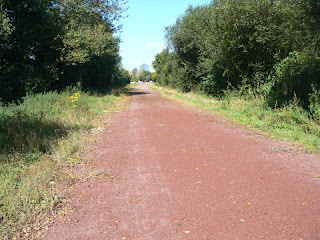 Being a disused railway route, it was a bit flat, and the gravel surface made it harder to ride on. I left the track somewhere that I thought might be St Sauveur-Lendelin but turned out to be Cambernon. I was ready to find a campsite by that point, so followed the D341 to Coutances. On arrival at Coutances, I stopped to look at the map and shortly a car pulled over, its occupant offering navigational assistance. 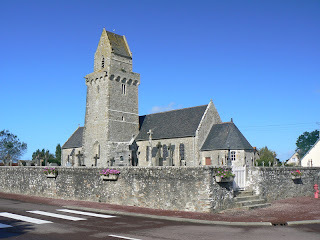 I said that I was looking for a campsite, and he knew of one in Coutances so offered to drive ahead show me the way. He mentioned that there was a bit of ascending and descending required to get there. No problems, I thought, I can handle a hill or two. What I have trouble handing is when those hills are on major roads and I'm battling straight into a headwind whilst trying to keep up with a car. 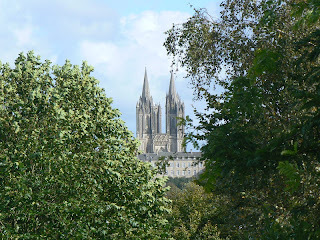 I'd also not realised how big Coutances is, and the campsite in question was a good couple of miles away. Nonetheless, I got there, thanked my guide and started to pitch up. Not a moment too soon - the rain started coming down just as dinner finished cooking!